It’s been a little while since I checked in, I’ve been working hard on some projects lately and had to take a break from something to make it all work. Even though everything in the works is a positive development I’ve still missed you all! So I’m popping in today with a new recipe – I hope you enjoy! 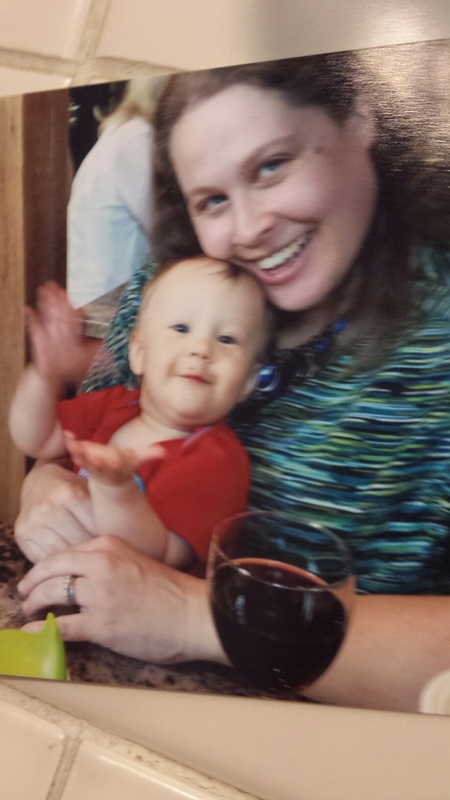 PJ has been teething like a fiend lately, which has not been fun for any of us, to put it mildly. 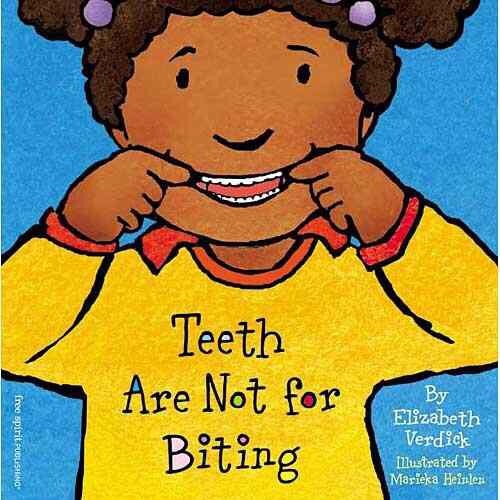 Teeth Are Not For Biting is now required bedtime reading. He finds it hilarious. I’m trying to keep cold things on hand, so I made up a batch of these babies today. Start with plain, low fat yogurt. Add a little coconut water to thin it, frozen fruit for flavor, and a teaspoon of extract to round it out. 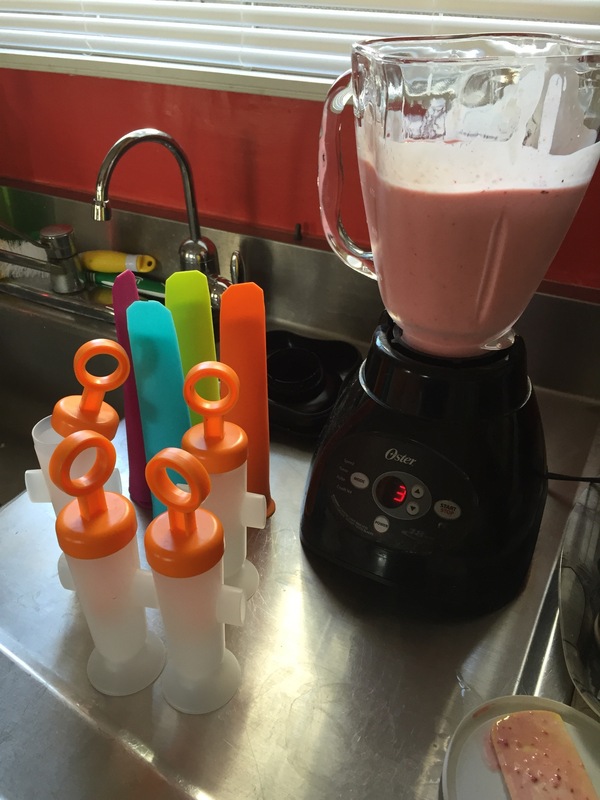 Then I blend it all up to the consistency of a smoothie and pour it into Popsicle molds. I have two sets now, one that is soft and squeezy and one traditional type with a stick. PJ prefers the squeeze kind because he can (mostly) feed himself with them. 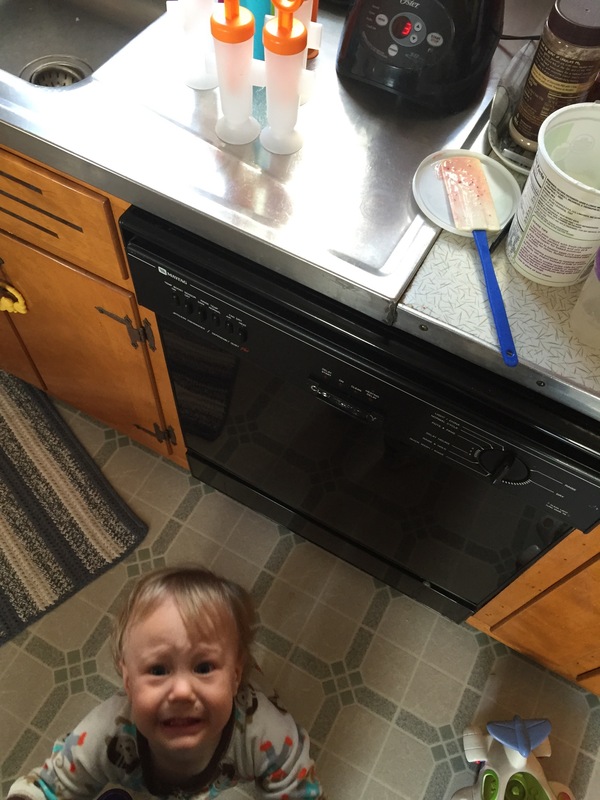 At this point, he realized what I was doing and insisted on a taste test – how pitiful is this face?! It’s probably a good idea that he did, because he let me know very quickly that I forgot to add a sweetener – oops! I use honey if I’m making these and not freezing them, or organic cane sugar if they’re going in the freezer like this batch. So after I added the sugar and poured them into the molds, I had the dreaded blender cleanup ahead of me, ugh! 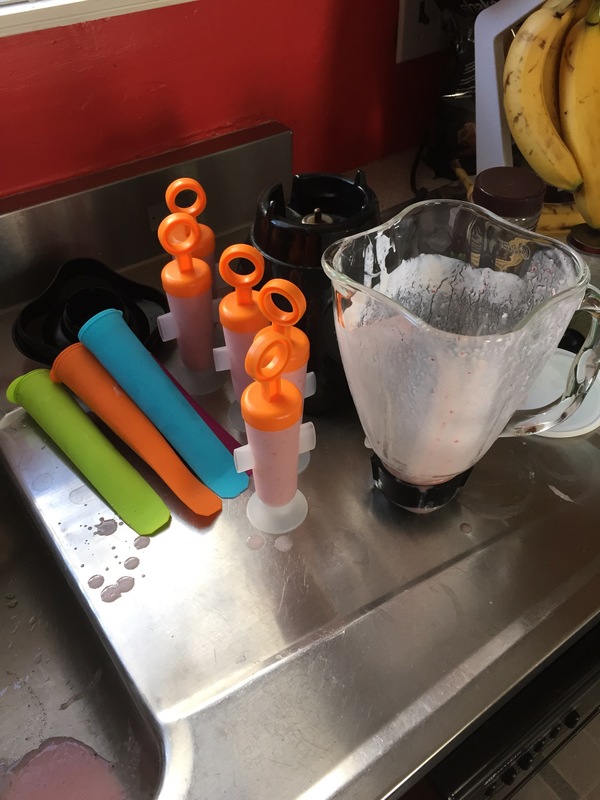 With all the blending I do for my morning shakes and these pops, I got really sick and tired of all that blender cleaning. Then I found this tip and it changed my life. I really wish I remembered which site I saw it on to give them credit, but it was months ago and I forget – sorry! If anyone knows, please tag them in a comment! I don’t have to tell you to keep the lid on while zhuzhing right? Anyway, afterwards I dip out some of the foam to clean the lid and the counters, and when I dump it out I wipe out the sink too for good measure. It takes way longer to write all this out than it does to make, and Mommy and Daddy have been known to sneak a “teething pop” or two for a snack – they’re delicious! 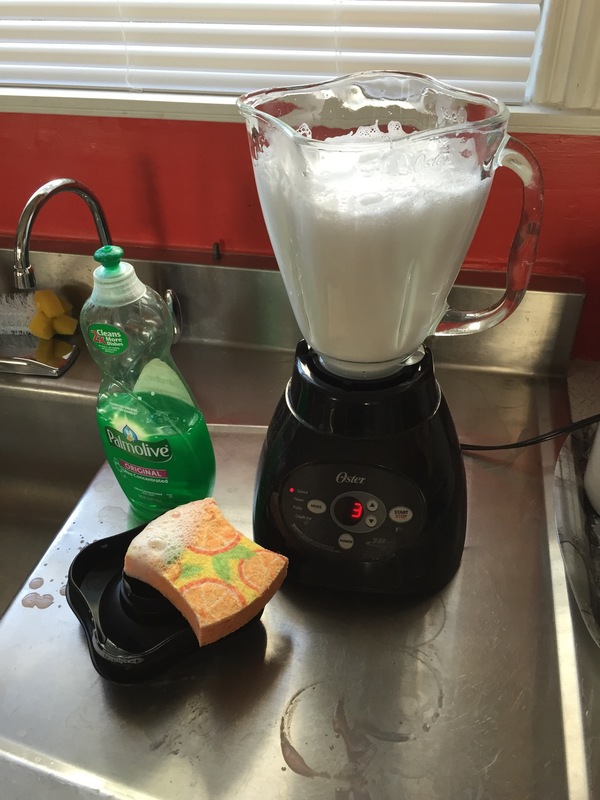 Put everything in the blender and blend until smooth. Freeze for 2-3 hours. 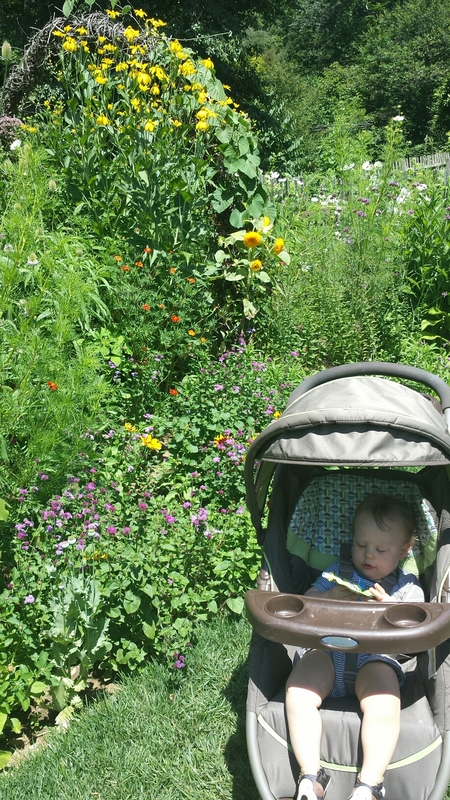 Too bad kiddo, this is one of Mommy’s top five favorite places in the Philly area and you’ll be spending a lot of time there! Although Marisia and I did decide that we need to make a sans enfants trip back there soon to drink in all that artistic inspiration. So after our trip to the gardens, I was wiped out but I really didn’t want to take the easy easy out and go out to dinner or order in since we indulged in our favorite Mexican restaurant the night before. And then I remembered that I had everything to make a fast, mostly veggie dinner. Score! 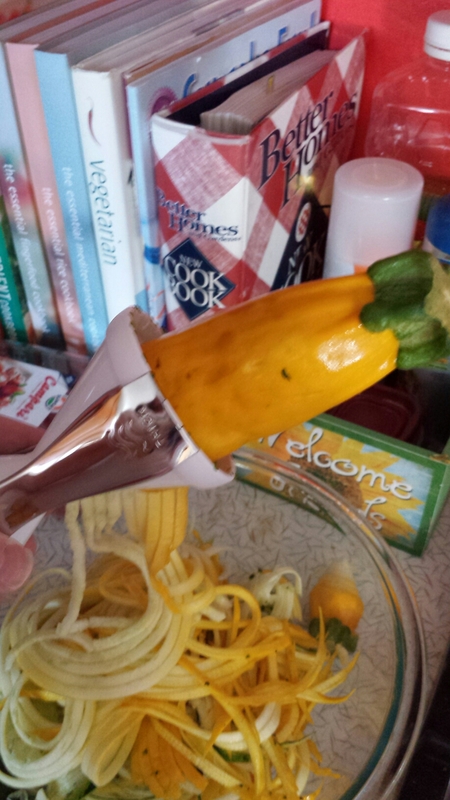 I pulled out my new Veggetti (handiest little thing!) and spiraled up some delicious squash. And then I pulled out my trusty bag of baby spinach, a chunk of Parmesan cheese, snipped some basil off the plant on my windowsill and tossed in a handful of walnuts. I threw everything in my food processor and pushed play. After the pesto was done, I sautéed my veggie noodles in a splash of olive oil then tossed everything together. Voilà! Dinner on the table in less than 15 minutes! The pesto pairs well with regular pasta too – my husband doesn’t care for the veggie noodles too much, but he does like the pesto when I use it on pasta. 1 – Spiral cut the squash. Sprinkle with salt to absorb the excess moisture and set aside. 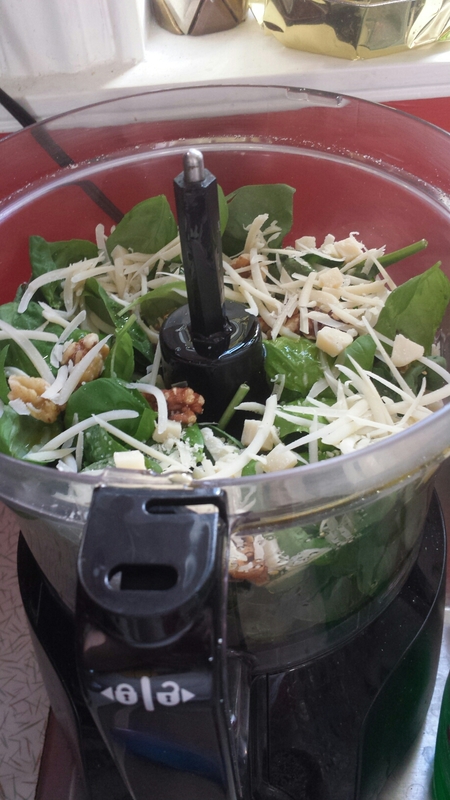 2 – Combine spinach, basil, cheese, and walnuts in good processor bowl. Stream in olive oil to desired consistency as processor runs. 3 – Sauté cut squash in olive oil for 5-7 minutes until just cooked through. 4 – Combine noodles with pesto and serve! 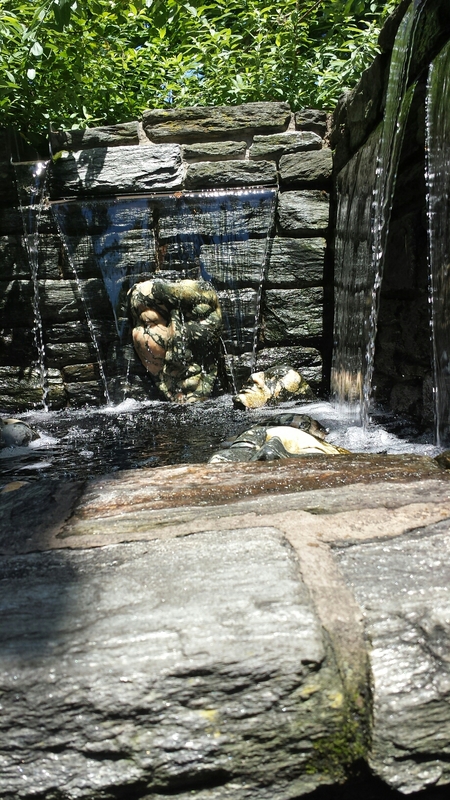 And seriously, go spend an afternoon at Chanticleer. You won’t regret it! Last week I shared a few things that I have started pushing my cart straight past in the grocery store. But of course clean eating is about more than eliminating processed foods, it’s also about eating more of the good stuff. I’ve found this to be a gradual process, which started for me when I first began making PJ’s baby food. As I looked for new foods for him to try, I made that fruit or vegetable part of my regular meals for the week as well. I have since started buying baby food for him because I could never master the consistency of meats especially, but he usually prefers to eat off of my plate now, and that is my biggest motivation to keep honest about my clean eating – it’s kind of like being pregnant or breastfeeding again without all of the pain and suffering. Win win! Collard greens – A lot of people told me that Napa cabbage makes a good substitute taco shell. Sorry to say, I did not find this to be the case lol. But I found this recipe for a chickpea avocado taco in a collard wrap, and am going to give the leafy shell thing another try! Turnips – These are surprisingly good substitutes for white potatoes in soups. They have a similar texture and absorb the flavor of the broth, and I really like using them this way. Brussels Sprouts – This is my new veggie to try this week. I’m going to see how they turn out roasted, which is one of my favorite ways to prepare almost any vegetable. 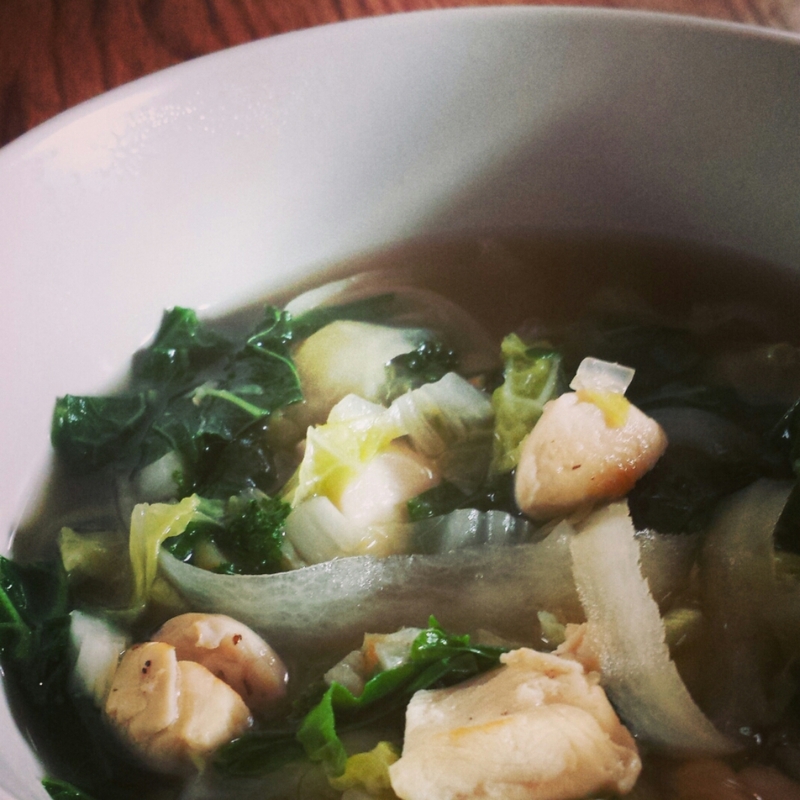 Bok Choy – I mentioned last week what a delicious soup this makes, but it’s also a great sir fry ingredient for a super fast and healthy dinner. Squashes – I’ve always loved zucchini, but am discovering a whole world of delicious squashes now. 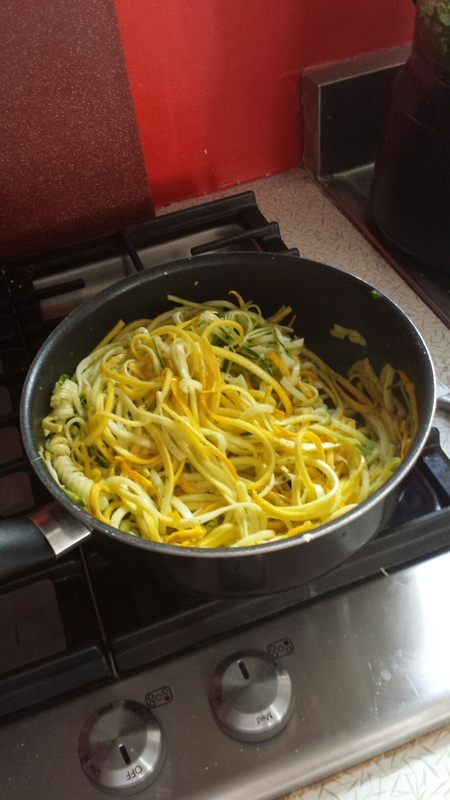 Spaghetti squash, and spiral cut zucchinis are helping me get through my love of pasta. This little Acorn squash is going to get roasted up with some olive oil and parmesan – yum-O! Tomatoes – Wait, what? Yes, tomatoes. I’m sure you don’t need serving suggestions for these, but I have personally always hated them and am just starting to cook with them regularly. I figured if I’m brave enough to try Bok Choy and Brussels Sprouts, I can try eating more tomatoes too, right? PB2 – Another new thing to try this week, I hear it is amazing especially when added to a protein shake! 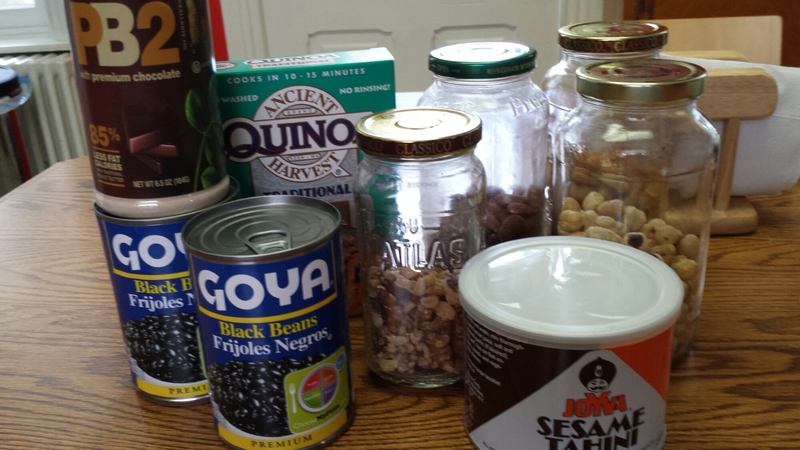 Black Beans – These fall into a category of things I have bought before but never really knew how to use. But now I add them to soups more often, and have a couple of good, quick taco recipes to throw them in. Yay for protein! Quinoa – I’m still not fond of this on its own, I prefer the texture of couscous honestly. But where I’ve really come to use it is in recipes that call for ground beef (like chili or meatballs), I substitute half the beef with quinoa to cut down the fat and still have a nice hearty meal. Bulk Nuts – These are some of my favorites. I used to just buy the package of overly salted, greasy, roasted nuts. But the bulk aisle had much better options available at pretty reasonable prices. Tahini – Check the organic or international foods aisle for this one. It’s the main ingredient in hummus, and other sauces. It kind of tastes like unsalted peanut butter in my opinion, and one small tub lasts a good long time in the pantry. Of course sodas are the first thing to go when you’re eating clean. And lucky for me, I love coffee, tea, and water. But that does get boring sometimes and processed powder drink additives are not in my clean eating plan! I also notice myself becoming more sensitive to dairy now that I eat and drink less of it, so I’ve started buying almond milk for my coffee and love it. My Shakeology gets a mention on both lists because I really never thought I would become a daily shake kind of girl, but I am a convert for sure. I confess that I kept a container of my grocery store brand, which has now been completely untouched in my pantry for several weeks! 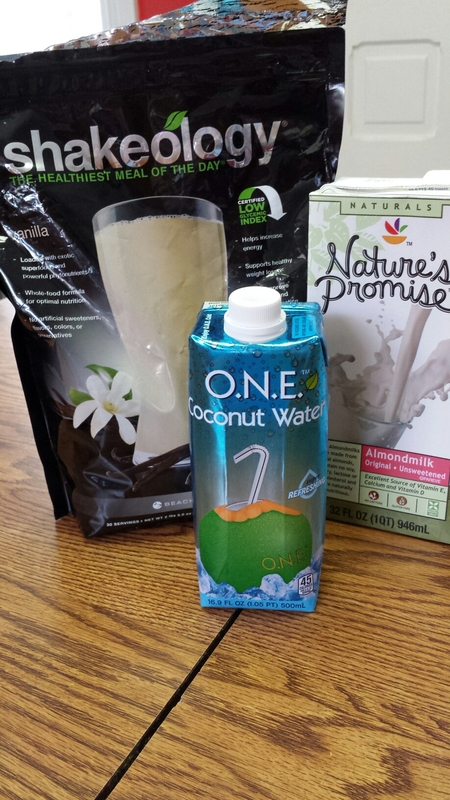 I find that coconut water mixes better with the shakes than the plain, and doesn’t have a very strong coconut flavor. I made a shake this morning with the vanilla powder, coconut water, blueberries, and couple of basil leaves – it was totally amazing. And the best part is that if I hadn’t thought so, there’s a 30 day, bottom of the bag money back guarantee on the Shakeology. 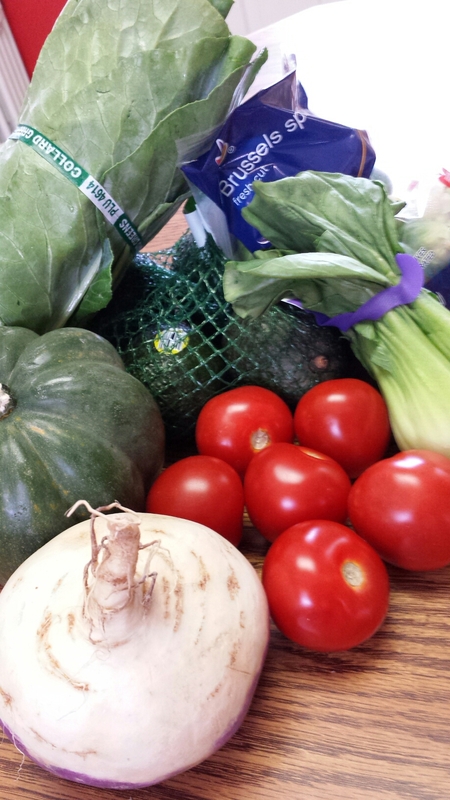 So there you have it – 12 of my personal favorite new staples on our clean eating adventure. What new foods have you discovered lately? Please tell, I am always looking for new ones! PJ may have just noticed that we’re eating clean in Neverland, but there have been some gradual changes happening for awhile that went right over that cute curly head! A big one is in the way we grocery shop. I’ve mentioned before that planning ahead and cooking extra foods on the weekends is a key part of how I manage to get through the week. 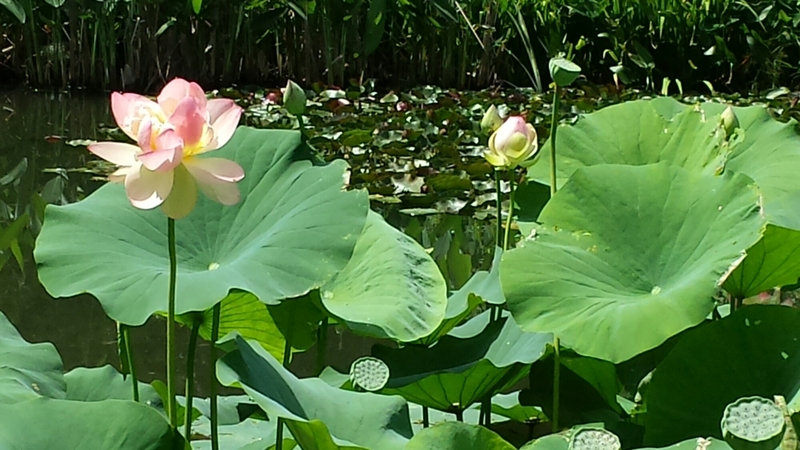 For my new friends (hello! ), I’ll recap that on the days I go into the office, I work 10 hour days so that I have an extra full day off with the little man. 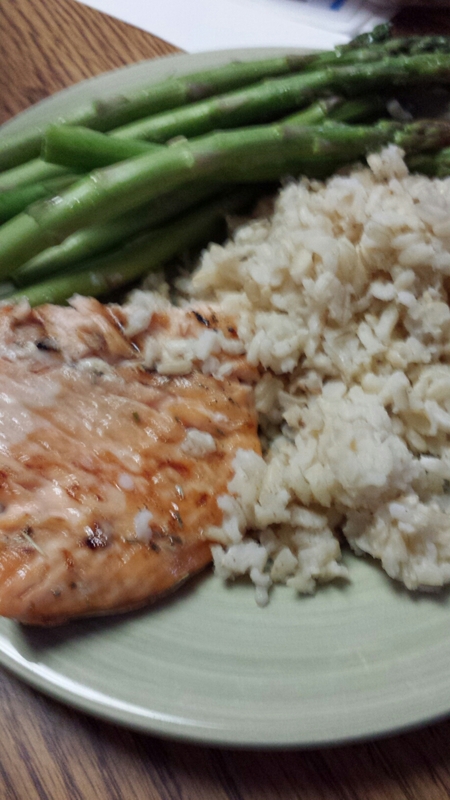 This is great in many ways, but being able to consistently get a healthy dinner on the table isn’t one of them. In the winter, I rely on my Crock Pot and casseroles that can be made in double or triple batches and frozen. Now that it’s too hot to run my oven so much, I’ve been having to adjust. I’ll admit that this was not a smooth transition. We went through a few weeks where we ate out or ate a lot of convenience foods, and I felt much worse for it. But things are getting easier, and I feel like I’ve finally got my mojo back to share some of my survival lessons learned with all of you lovely people! My best summer plan ahead tool is our grill. I do all of our meats for a week at the same time – and we actually have a bigger variety than we did during the winter because of it. Last night, for example, PJ and I had grilled salmon and Paul (who is not a big fan of seafood) had pork chops – and it took next to no extra time, and didn’t break my “one family, one dinner” rule because I was already preparing multiple recipes. Win win! And now we have pork chops frozen to eat another night next week! Honey Cashew Oatmeal - way better than anything you find premade in the cereal aisle! Oatmeal is one of my favorite breakfasts. It’s easy to pack, keeps me full almost as well as eggs, and can be dressed up so many ways. I stopped buying premade packets and started buying rolled oats (in bulk when I can get them). Every few weeks, I make up my own packets in snack size baggies. I put a half cup of oats into each baggie, add any dry ingredients, and write on the bag with a sharpie any wet ingredients to be added when I’m ready to eat it. I usually do two bags of each flavor and store them in the pantry. Check out my “Rise & Shine” Pinterest board for the recipe pictured above and some of my other favorite varieties! 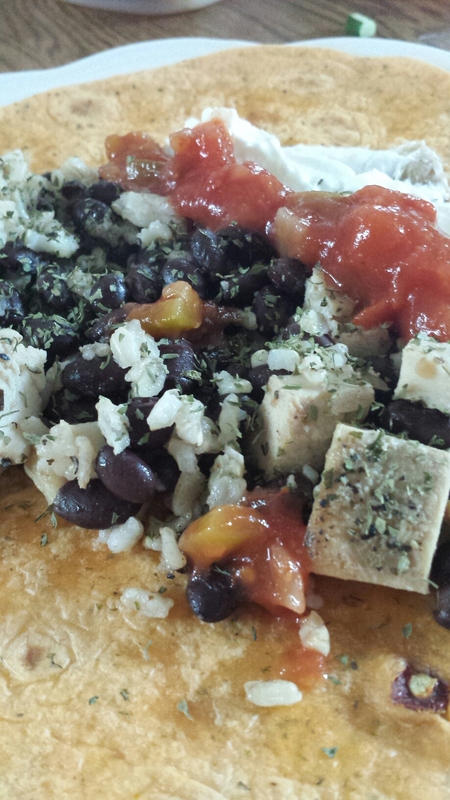 Thawed frozen rice, leftover chicken, and a can of black beans make a great burrito in next to no time! For awhile, I bought these so we could have a quick side dish when I heated up a pre-made dinner, or to use in casseroles to save the time of cooking rice before baking. And then one day it occurred to me to try cooking a BIG pot of rice and freezing it in smaller portions. I let it cool, then divide it into quart size freezer bags which conveniently hold about two cups each. Squeeze the air out of them and freeze flat. Saves space, and I only have to do it once every month or two. I cook the rice with chicken stock and add any other flavorings when I reheat it. This is a favorite snack in our house. Even the baby likes it! But a small container is fairly expensive, so it used to be an every now and then treat. Then I discovered the awesome blog 100 Days of Real Food and purchased one of her recipe collections, which included a recipe for hummus that is to die for. That particular collection isn’t available right now, but if you follow her blog I am positive you will find several other similar recipes that can replace pre-packaged staples in your grocery order. 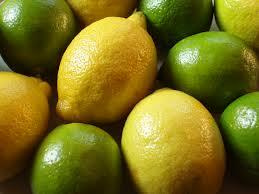 This one may be pretty obvious, but I’ve made it a point to cut out lemon juice and lime juice from bottles. I buy in bulk when they are on sale, run them through my juicer and freeze the juice in cubes. Bonus: it makes my kitchen smell amazing! I’ve been eating a lot of salads since the weather turned it up a few notches. And I’ve found that it’s much better and easier to make my dressings than buy them. Like oatmeal, the varieties are endless – pear and arugula salad with a cinnamon pear vinaigrette, anyone? Although my go to favorite is to just splash together some olive oil, lemon juice, Italian seasoning, and a dash of salt. 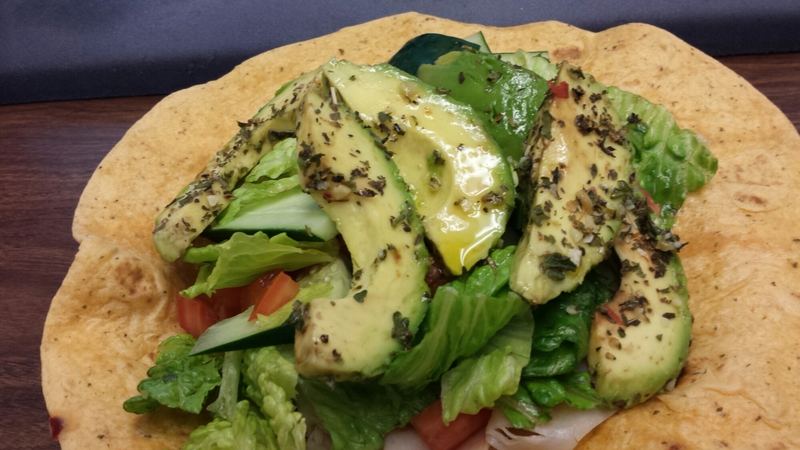 It goes well with just about everything, including this delicious turkey wrap with avocado! This is a newer one, and a surprise even to me. 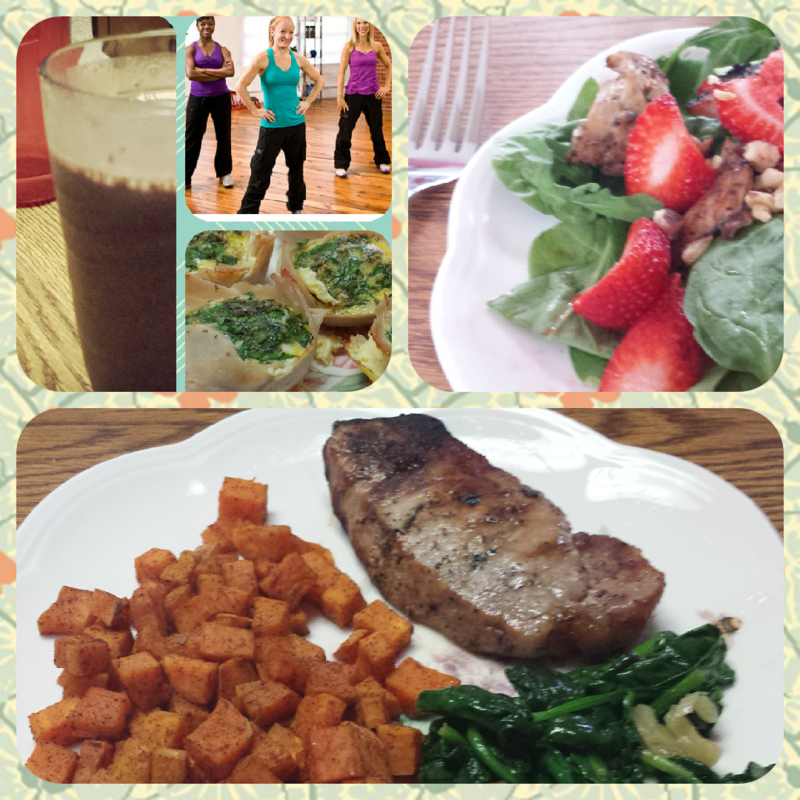 I have resisted protein shakes as I’ve been getting further into clean, whole food cooking. I was all “Why do I need that when I’m eating all these different proteins, fruits, and veggies already?” Buuuut, I decided to listen to a friend of mine who has had some pretty amazing success with the Beachbody program, and added shakes after my morning workouts. Holy breakthrough, Batman! I actually found that a shake early in the morning helps me snack less the ENTIRE day. 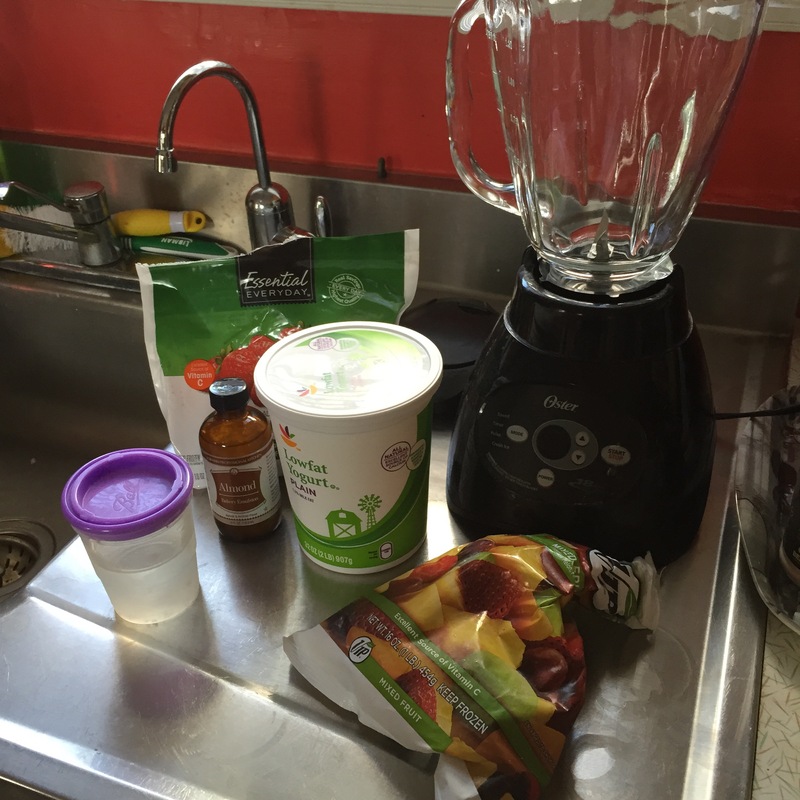 But because I’m stubborn and skeptical, I started out with grocery store shakes to save some money. They made a difference, but eventually I took the plunge and ordered the real thing (Shakeology) and I feel better on a whole different level. One of the things I love is that the ingredient list derives nutrients from actual food and tells you what they are. I hope that you’re all having a great summer so far, and would love to hear what your “hot weather” coping strategies are for preparing healthy meals, especially if you try to cook ahead like I do! Yesterday, I stumbled on a marathon of Extreme Couponing – that’s the show where people rack up $700 or $800 bills in a grocery store, tie up a line and hold up one or several store managers to approve their transactions, and walk out paying as little as $4. And then they show these people triumphantly stacking their purchases at home where, I can only assume, they are preparing for their next reality show audition on Hoarders. I love the idea of coupons, and my BFF Anne has a great system in place that stretches her family’s grocery budget a very long way. And when it makes more sense for the final price to buy more items than her family can use, she does the kind and sensible thing and donates the extra to a local food pantry. So there’s obviously a healthy way to go about the couponing thing, and I’m sure that I will be picking her brain on that a lot as our family grocery system evolves. But for right now, I just can’t get my head around it. When I look at the total crap that these extremist people buy, I have to wonder if it’s even worth the $4 they’re paying? I can’t remember seeing a single piece of fruit or fresh vegetable in those carts. If your grocery budget is $10 a week (like some of these people said), but you aren’t actually walking out of the store with any food, what’s the point? I do still buy processed food, but I’ve been working on cutting out some of them out and replacing them with homemade. You’ve seen my series about cooking freezer meals instead of buying packaged heat & eats. And right before the holidays I cut out store-bought bread and started baking my own at home. My next target is freezing homemade soup instead of buying canned. Once I stop having to remind myself to make something instead of buy it, I move on to the next thing. I feel especially committed to this now, as I’m making PJ’s baby food and I want him to grow up clearly knowing the difference between the flavor of fruit, and fruit-flavored. I have to say that I feel much better when I’m able to stock my kitchen and freezer with fresh-made meals and snacks, but the problem is that this can be much more expensive. I really wish there were more coupons for ingredients rather than for packaged products. If I’m wrong about that, and anyone knows sites where I can find them, please let me know! The couple of times I’ve tried to sit down and comb through the coupons for things that we use, I’ve ended up with a whopping $2 or $3 in savings and it takes me at least an hour. So where do you guys fall on the scale? 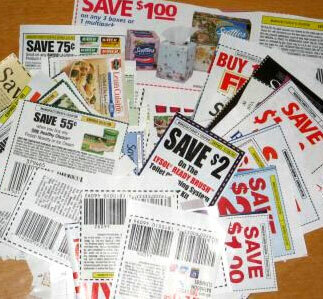 Are you more about saving money with coupons, even if it isn’t on products you would prefer to buy? Or are you all fresh and/or organic all the time, even if it costs more? Thanksgiving is coming early to Neverland! We’re hosting dinner on Sunday for some of my husband’s brothers and sisters, and I’m excited for what I hope will be the start of a new tradition. The assembly is the tricky part, but I’ve got a few tips to help you out. Anything *surrounded by stars* is something that I’ve found makes a big difference. 1) Fill a *glass* measuring cup with more water than you need and *add at least 4 ice cubes*. Set aside. 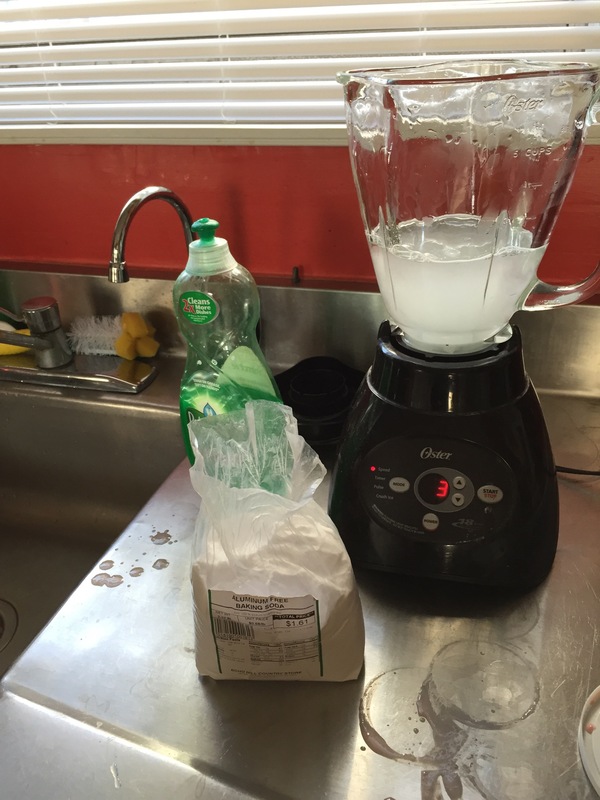 2) *Sift* your 2 cups of flour into your mixing bowl. Add the teaspoon of salt and give a quick stir with your *pastry blender*. 3) Add your 3/4 of Crisco *in 1/4 cup increments* so you have three separate dollops (or ten smaller ones if you’re like me and can never get it all out in one scrape). 4) Use that *pastry blender* to cut the Crisco in until it’s evenly distributed through the bowl (it will be both mealy and lumpy. Go with it). 6) After each tablespoon, use a fork to *press the dough from the outer edge of the bowl to the center*. 7) The dough will still look very floury after 5 tablespoons, but *stop with the water anyway*. You can lightly shape it with your hands into two balls *one just slightly larger than the other if you are making a double crust pie* or evenly to make two single crust pies. 8) Roll the dough out *on a floured metal cookie sheet*. Start in the center and change direction every couple of rolls. The cookie sheet keeps your dough cold and lets you move the dough to get a better angle without having to scrape it up and risk breaking it first. 9) When you are done rolling, *use a butter knife to completely separate the dough from the cookie sheet before attempting to move it*. I do not care what those toothy little liars on the Food Network tell you, crusts don’t lift off nice and pretty just by loosening the edges. Again, this is where cookie sheet comes to the rescue because you can spin it to reach every spot. 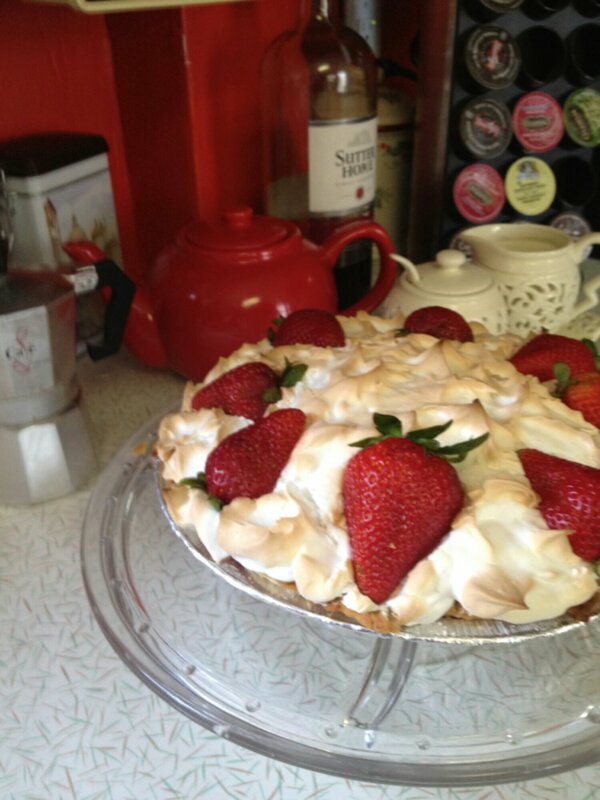 10) For a 2-crust pie, the slightly smaller crust goes into the pan, and the larger one is the lid. For both, put the ugly side towards the inside of the pie (you’ll know what I mean when you scrape it loose). 11) Check if your recipe calls for a baked shell first, then fill and decorate! Here’s one of my favorite freezer meals. It’s an adaptation of one of Tricia Yearwood’s recipes (original is here.). I cut the butter WAY back, switched in sour cream for the half and half (sour cream is one of the few dairy products that works in freezer recipes), and added green beans to get another veggie in.